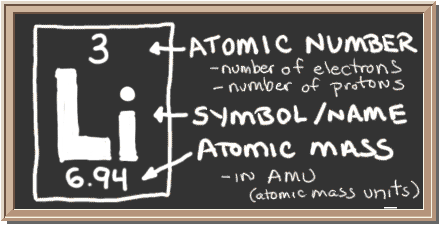 So... for the element of LITHIUM, you already know that the atomic number tells you the number of electrons. That means there are 3 electrons in a lithium atom. Looking at the picture, you can see there are two electrons in shell one and only one in shell two. ► More about the history and places to find lithium. 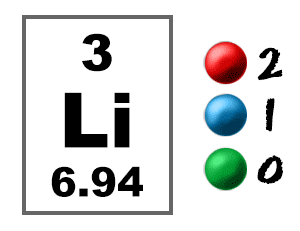 Two lithium (Li) atoms can bond with one oxygen (O) atom, making the formula Li2O. Oxygen likes to have two additional electrons to make it happy. Each lithium atom provides one. 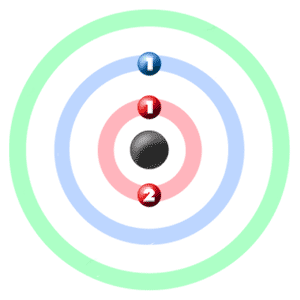 You can see that the oxygen atom has eight electrons (6 of its own, and one from each lithium), and the two lithium atoms have two electrons each. One lithium atom can combine with one fluorine (F) atom. Together, they make the formula LiF. Fluorine has seven electrons of it's own. Lithium gives up its one electron to make both atoms happy. So the fluorine atom has eight electrons, and a filled outer shell.